Winner of multiple awards, including the Hugo and the Nebula, American Gods is Neil Gaiman’s sweeping exploration of story, myth and the shifting nature of belief itself. According to Mr Wednesday, gods travelled to the new world with their immigrant worshippers only to flounder in a land both too strange and too modern to nurture them. Although the story is rooted in the familiar – Gaiman gives us Egyptian deities who run funeral parlours, and gods who drive cabs to make a living – it tears back the veil to reveal the pulsing supernatural heart of America. Crammed with unconventional yet wholly engaging characters, this story of coin tricks, cons and misdirection is considered by many to be Gaiman’s masterpiece. Award-winning artist and illustrator Dave McKean first worked with Gaiman on the graphic novel Violent Cases before going on to work with him again on Sandman, a comic book series that revolutionised the form. 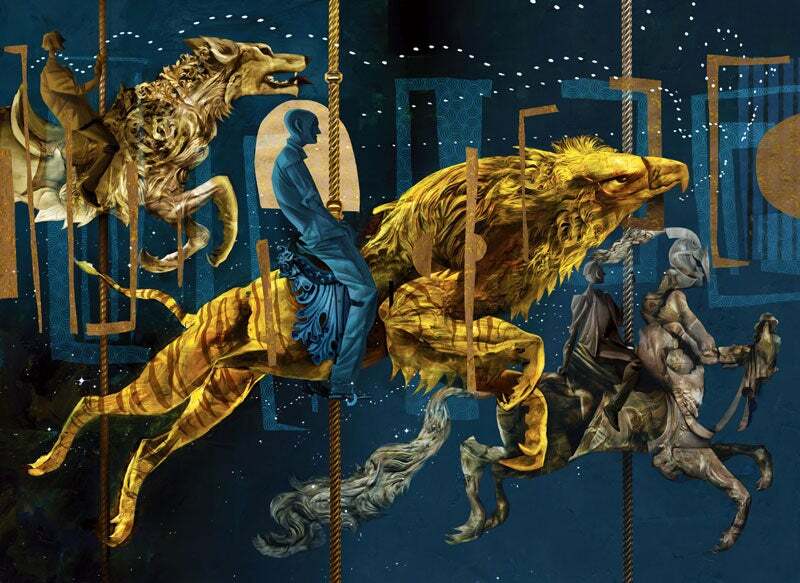 Like Gaiman’s stories, McKean’s multimedia pieces, with their layered meanings and half-monstrous creatures, capture the uneasy relationship between the real and the unreal. Now a legendary creative team, Gaiman and McKean have joined forces on several celebrated projects, including illustrated editions of The Graveyard Book and Coraline. For this special collector’s edition, the only colour illustrated hardback volume currently available, McKean has created 12 extraordinary illustrations, including three double-page spreads and a frontispiece, as well as designs for the binding and slipcase that complement and mirror each other. The slipcase artwork features an impressionistic image of Shadow in his cell on the front, and a bison – a nod to the buffalo man who recurs as Shadow’s guide in the novel – on the back. The binding plays with these images further, interweaving them using stylised, dynamic shapes, suggesting the overlaying of the supernatural realms and the real world in the novel itself. Neil Gaiman is a critically acclaimed writer of short fiction, novels, comic books, graphic novels, audio theatre and films. His many notable works include the groundbreaking series Sandman (the first comic book to win a literary award, the 1991 World Fantasy Award for Best Short Story) and the novels Good Omens (1990, in collaboration with Terry Pratchett), Stardust (1999) and American Gods (2001, winner of the Hugo Award and Nebula Award for Best Novel). His writing for young readers includes Coraline (2002, winner of the Hugo Award and Nebula Award for Best Novella, and a Bram Stoker Award for Best Work for Young Readers) and The Graveyard Book (2008, winner of the Newbery Medal and the Carnegie Medal). Credited with being one of the creators of modern comics, Gaiman is an author whose work crosses many genres and reaches audiences of all ages. His most recent publication is Norse Mythology (2017). This collector’s edition of Frank Herbert’s phenomenal tale of far-future desert warriors, fallible messiahs and interplanetary intrigue is illustrated by award-winning artist Sam Weber, and published to celebrate the 50th anniversary of the world’s best-selling science-fiction title. Neil Gaiman’s raucous comedy Anansi Boys bursts into the spotlight in an extraordinary Folio collector’s edition, filled with vibrant images by artist Francis Vallejo and introduced by Afrofuturist Nalo Hopkinson. In publishing Hermann Hesse for the first time, Folio presents an edition of Steppenwolf featuring images by Dan Hillier, and a very unusual facsimile, bound into the book itself.